incelenen 1840 gastrik biyopsi geriye dönük olarak incelendi. ve yetersiz (yüzeyel) biyopsiler olarak üç gruba ayrıldı. 2'sinde (% 7.6) sonuç anlamlı değildi (yetersiz biyopsi). results of second biopsies if taken. 1. Niknam R, Manafi A, Fattahi MR, Mahmoudi L. The association between gastric endoscopic findings and histologic premalignant lesions in the Iranian rural population. Medicine (Baltimore) 2015;94: e715. 2. Fock KM. Review article: the epidemiology and prevention of gastric cancer. Aliment Pharmacol Ther 2014;40:250–260. 3. 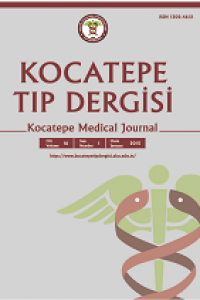 Yuyucu Karabulut Y, Bozdoğan Arpaci R, Dölek Y, Topal F. What is the consistency between the diagnoses of endoscopists and pathologists concerning malignant lesions of the gastrointestinal tract? Endoscopy Gastrointestinal 2014;22:53- 6. 4. Al Hamdani A, Fayadh HM, Abdul Majeed BA. Helicobacter pylori gastritis: correlation between endoscopic and histological findings. IJGE 2001;1:43-8. 5. Kasap E, Güngör G, Aygör E, et al. What is the consistency between the diagnoses of endoscopists and pathologists concerning gastroduodenal mucosa? Endoscopy 2012;20:13-6. 6. Irkorucu O, Gultekin FA, Ucan BH, et al. Agreement Between Pathologic Diagnosis and Endoscopic Findings on Esophagogastroduodenoscopy Performed by General Surgeons. Med Bull Haseki 2011;49:26–9. 7. Sharma S, Makaju R, Dhakal R, et al. Correlation between Endoscopic and Histopathological Findings in Gastric Lesions. Kathmandu Univ Med 2015;51:216-9. 8. Pailoor K, Sarpangala MK. Histopathological diagnosis of gastric biopsies in correlation with endoscopy- A study in a tertiary care center. Adv Lab Med Int 2012;3:22-31. 9. Redeen S, Petersson F, Jonsson KA, Borch K. Relationship of gastroscopic features to histological findings in gastritis and Helicobacter pylori infection in a general population sample. Endoscopy 2003;35:946–50. 11. Lim JH, Kim N, Lee HS, et al. Correlation between Endoscopic and Histological Diagnoses of Gastric Intestinal Metaplasia. Gut Liver 2013;7:41–50. 12. Carr NJ, Leadbetter H, Marriott A. Correlation between the endoscopic and histologic diagnosis of gastritis. Ann Diagn Pathol 2012;16:13–5. 13. Sheiko MA, Feinstein JA, Capocelli KE, Kramer RE. The concordance of endoscopic and histologic findings of 1000 pediatric EGDs. Gastrointest Endosc 2015;81:1385-91.